The height-adjustable hooks not only reliably hold the hammock but also allow you to adjust its position according to your preferences. Can be placed only on flat surfaces. If you don’t have trees in your garden, it’s not a reason to deprive yourself of superior comfort. 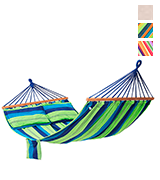 This is a comfy free-standing hammock that comes with a complete set to help you create a relaxation spot wherever you want. 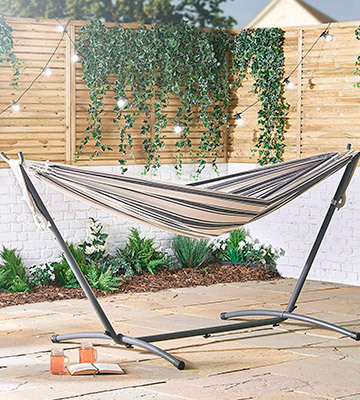 The stand and the hammock weigh just 13.5 kg in total and can be easily moved around your garden to follow the sun or shade. The max weight capacity isn't that high. VonHaus offers an incredibly lightweight and packable steel-framed hammock for you and your significant other, which can provide you with long hours of relaxation in your garden and beyond it. This nester is made of canvas material and has a dirt-proof design. Moreover, it can be safely thrown in a washing machine (delicate cycle). Canvas tends to get rather hot on extremely sunny days. This hammock is perfect in terms of quality/ price ration. So if you're looking for a simple model without any add-ons and have suitable trees in your garden (or some spare stand in your closet), we see no reason not to give it a try. 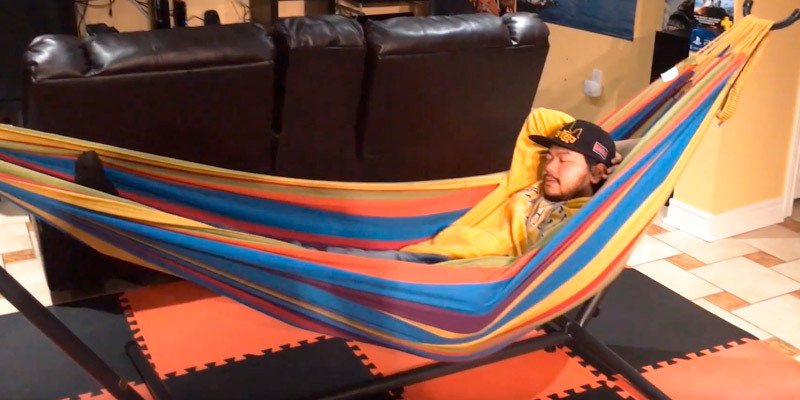 This hammock can be used right out of the box. It comes with 2 carabiners and 2 hanging straps, enabling you to attach it to the trees without having to buy anything else. The storage bag isn't very large and placing the hammock along with the mounting hardware kit in it might be a bit tricky. 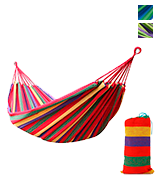 Handcrafted from comfortable cotton fabric, this Brazilian hammock is ideal for cooler temperatures. It will restrict the airflow and help you preserve body heat during chilly summer evenings. It features two strong wood spreader bars on the ends that prevent the "cocoon effect" and make the whole construction much more durable. The set doesn't include installation ropes and hooks. 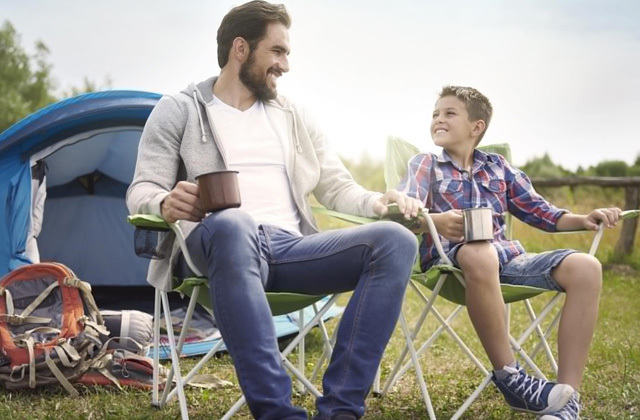 The SONGMICS GDC22L is an excellent choice for households enjoying outdoor activities. It's wide and heavy-duty to accommodate two people comfortably. Plus, it includes two pillows and can double as a comfy mat. 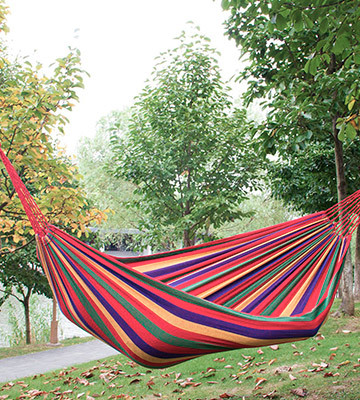 Do you have a lovely garden but there are no perfect trees to attach a hammock? 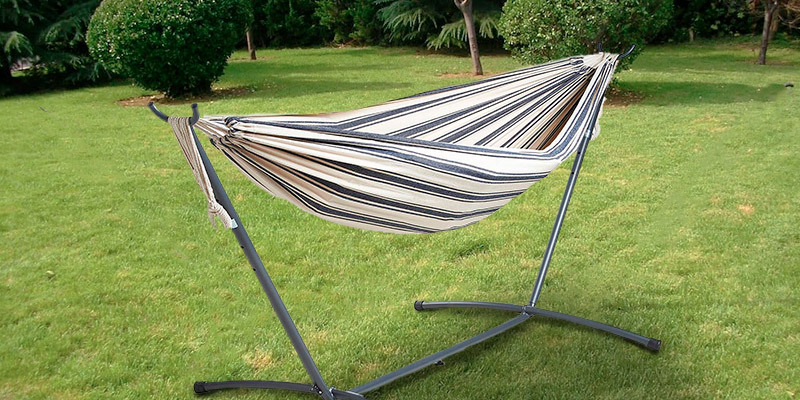 That’s not a problem for Vivere UHSD08-20, a double hammock that boasts freestanding design. 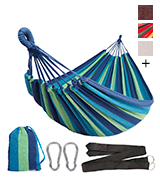 Along with the hammock itself, the set includes a carrying case and a stainless steel stand. 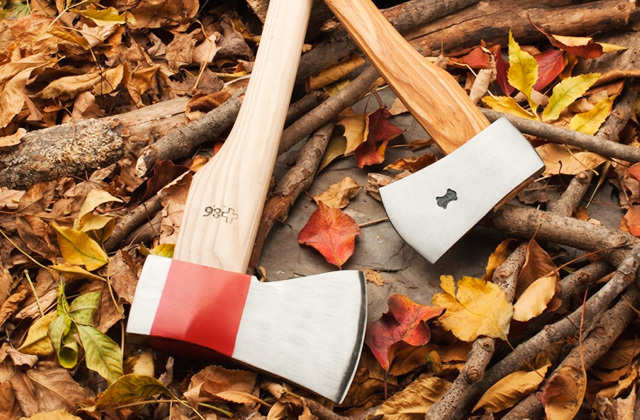 To set it up, you don't need any tools or a lot of time. Just find a flat surface and the stand will go there perfectly. What is also great about the stand is that it's relatively lightweight. 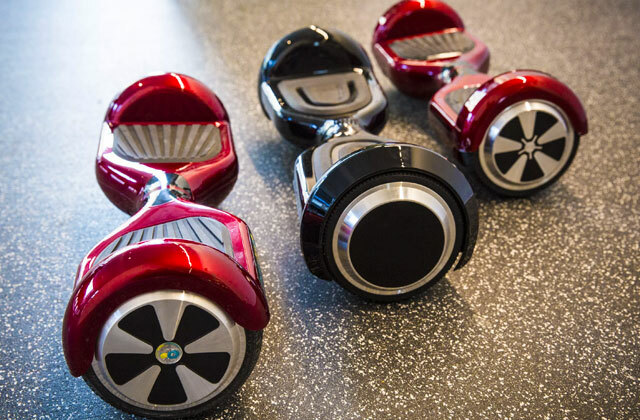 Weighing around 16 kg, it's easy enough to manoeuvre it around your backyard, patio, or pool. 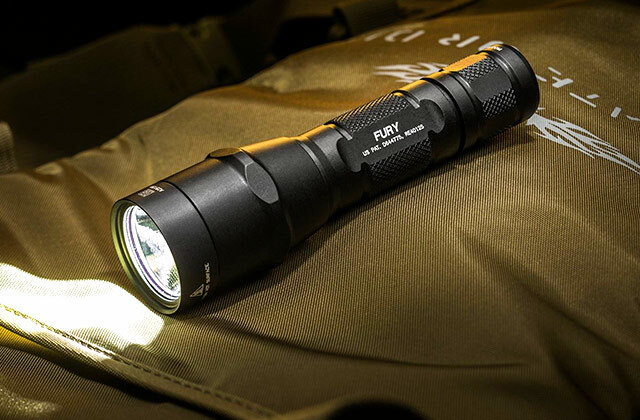 That said, it's as lightweight as it is reliable. Made from heavy-gauge steel pipes it can comfortably support up to 205 kg, so two adults and a kid can drop down in this hammock and have fun, swaying above the ground. 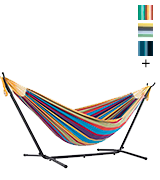 The double hammock itself is tightly-woven with high-quality threads. It easily hangs over the frame and can be adjusted lower or higher to your preference. The hammock is available in different designs and three fabric types - 100% cotton, heavy-duty polyester and weather-resistant Sunbrella, so you can choose whichever comes to your liking. No matter which one you choose, you're guaranteed to enjoy the superior level of comfort, which distinguishes all Vivere's products. In all, if you don’t have trees in your garden, it doesn't mean you should deprive yourself of comfort. This complete set can help you create a relaxation spot wherever you want. If you’re looking for a reasonably-priced hammock in which you could lounge while sunbathing on the beach, camping in the woods, or relaxing in your backyard, the VonHaus 2 Person Hammock With Metal Frame can be a real steal. As it's easy to decipher from the product's description, the VonHaus 2 Person Hammock comes with its own stand, which offers you the advantage of positioning it anywhere in your yard (or outside of it) without having to look for suitable trees between which you could suspend a hammock. 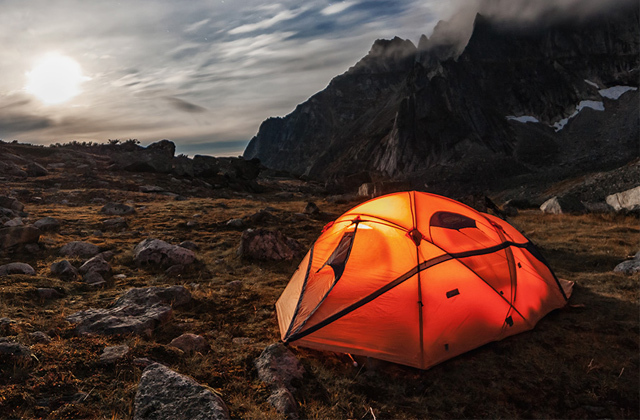 This makes it an excellent option for outdoor lovers who never know where they will be landed next. The stand and the hammock weigh just 13.5 kg in total and can be easily moved around your garden to follow the sun. The model can be taken down and put together in a matter of minutes with no extra tools required. Plus, the package includes a handy drawstring bag with assembly instructions. 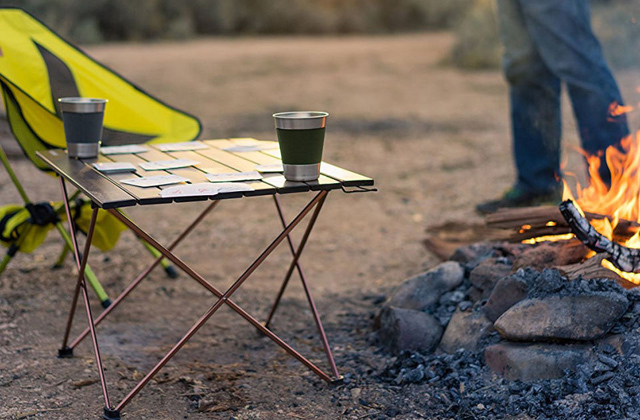 Hence, you can easily pack the hammock with the stand and take it with you on your next beach BBQ party. 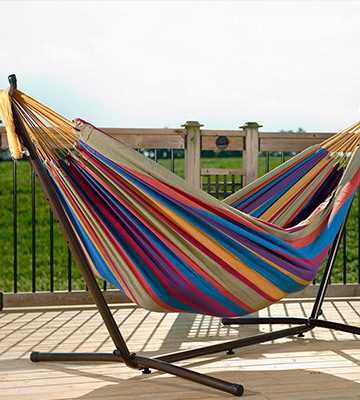 The hammock is produced from the mixed woven fabric that is very soft, comfortable, and durable. It has a summery blue and white stripe design, which can add a cheerful hint to your garden. The lounger is large enough to allow two adults to chill out after a hard day. 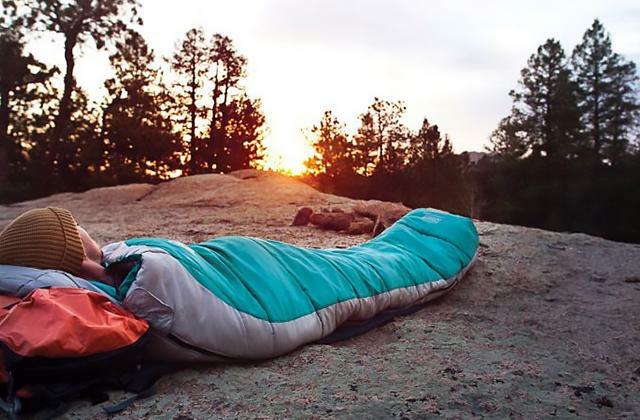 It’s an incredibly lightweight and packable hammock for you and your significant other, which can provide you with long hours of relaxation in your garden and beyond it. Despite falling into the category of budget models, the Signswise UK-0204-01 is quite big on features. It's made of a durable canvas and is stoutly-built overall, allowing it to provide a high degree of comfort and support. The canvas has a dirt-proof design and doesn't feel tough, so that you can lie in it for hours without experiencing any discomfort. Also it looks absolutely lovely, thanks to its colourful stripy design. 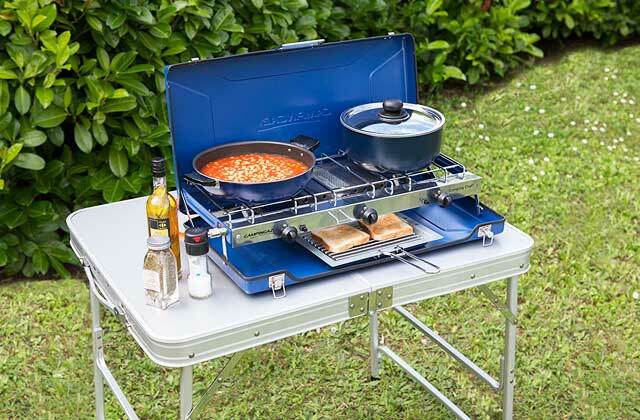 The comfort and portability are the strength of the Signswise UK-0204-01. 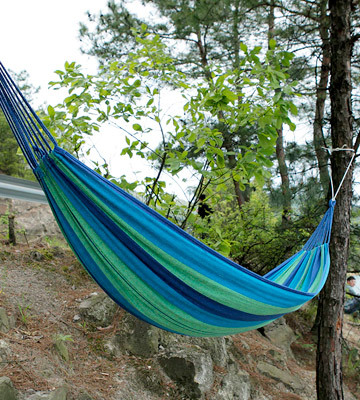 The hammock comes with a fabric carry bag for hassle-free transportation, and is easy to set up. With each end featuring a white rope, the hammock can be quickly secured to any hanging points, so you can hang it anywhere you see fit: in your patio, courtyard or carry it with you when you are going camping, hiking, picnicking, and so on. To wrap things up, the Signswise UK-0204-01 is a great value for the money. We'd even say that it presents that rare case when you get more than you pay. The hammock is lightweight, yet sturdy and durable. It's easy to assemble and includes all the mounting kit you need. So, if you're not bothered with add-ons, we see no reason why not to give the Signswise UK-0204-01 a shot. 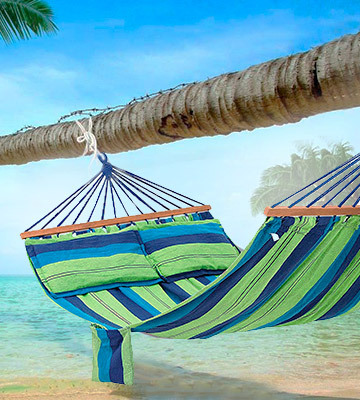 The Anyoo Handcrafted Brazilian hammock is another mid-priced model, ideal for those who want to keep cost and weight down. However, there's more to it besides its relatively modest price. What makes this hammock even more attractive is that it can accommodate up to 200kg, the weight few other portable hammocks can match. Another advantage of this hammock is the fabric. Constructed of tightly-woven cotton, it feels ultra comfortable and doesn't let you sweat, thanks to its thermo-regulating properties. 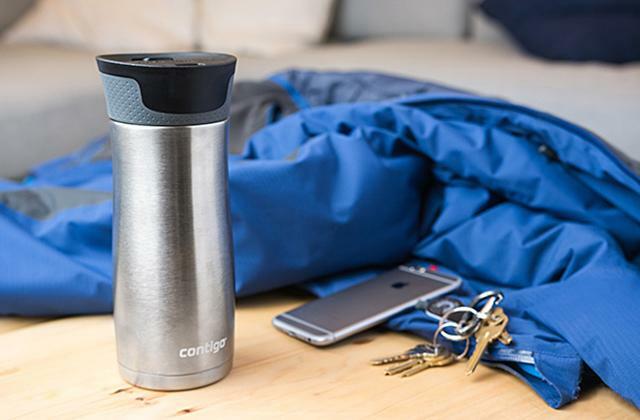 With that, it perfectly preserves body heat and allows you to feel toasty warm during cool summer evenings. 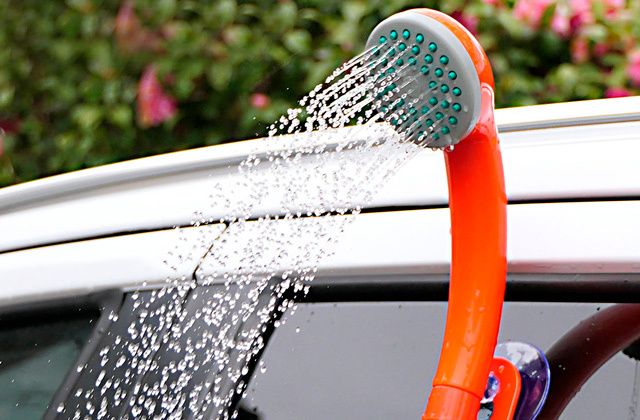 Also, this material is mildew-resistant, making it suitable for use in damp conditions. 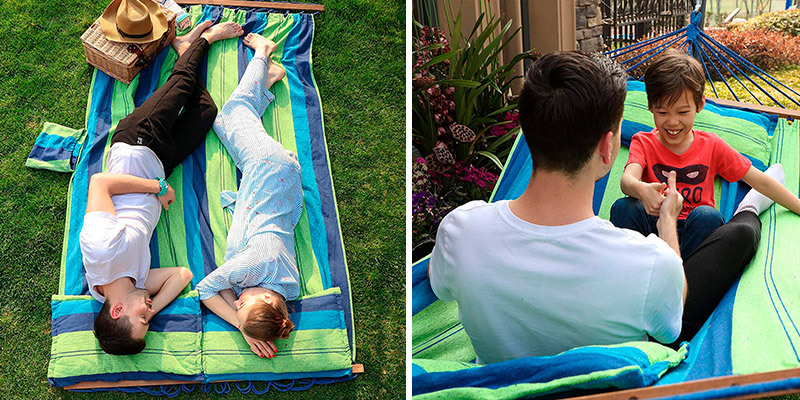 Other than that, this hammock is a perfect place for two people. It has a low to the ground design making it easy to get in and out, and accommodates even beefy people rather comfortably. Also, it comes with a complete mounting hardware kit, so you can start using it right away without having to buy anything extra. 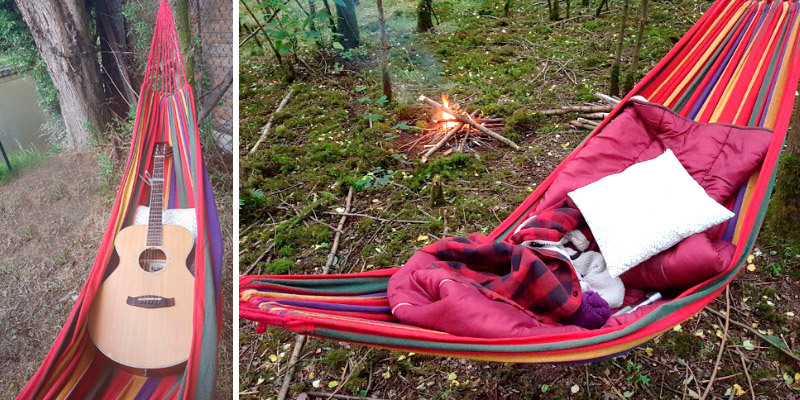 Finally we'd like to mention the hammock design. This model is produced in several colour options ranging from neutral to bright red, so everyone can find something that will suit their taste. 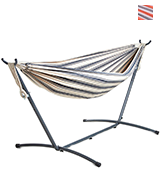 To sum up, the Anyoo Handcrafted Brazilian hammock is one of the best models in its price range. 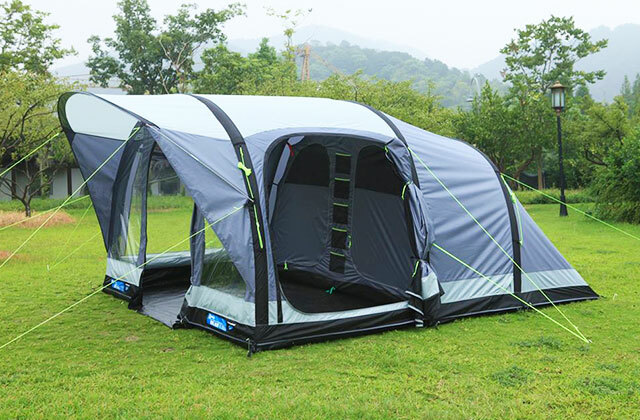 It's made of top-quality materials, feels sturdy, can hold two people comfortably and is great at preserving body heat. All these things make it perfect for couples that live in a mild climate with warm days and chilly evenings and love to spend time outdoors. It is easy to notice that the SONGMICS double garden hammock differs from other entries on the list. It has two strong wood spreader bars on the ends that keep it unfolded so that the cocoon effect is reduced, and make the whole construction reliable and durable. Thanks to this peculiarity, the hammock is able to withstand an incredible 300 kg of weight and provides ample space for two people to rest. That same thing makes it possible to use it as a sofa, swing, and as a child's cradle. 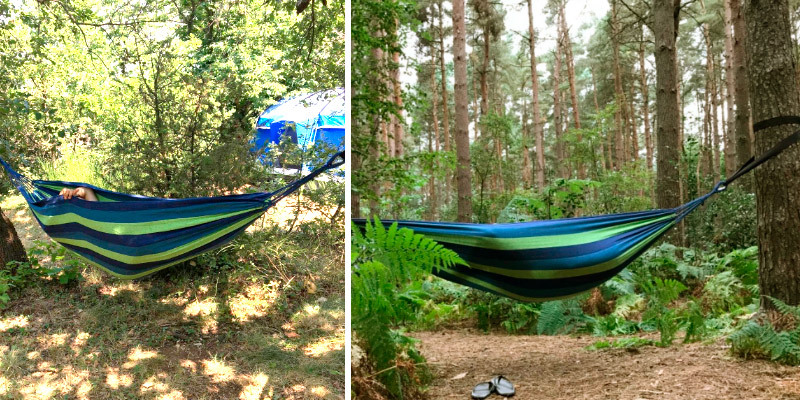 The SONGMICS double garden hammock is easy to suspend: you can fix it on a commercial bracket or attach it to trees with ropes, depending on the location. Taking it off is same easy, which is recommended to do when you don't use it. Keep note though that installation ropes and hooks are not included in the package and you will need to buy them separately in order to use the hammock, which won't be a problem to do due to a wide assortment of accessories available. What might be considered a problem is that you will need to spend a few extra quids on those things. That said, if you value quality, that extra spending will be worth it. Handcrafted from 70% cotton and 30% polyester with tear-proof selvedge, the SONGMICS double garden hammock is perfect for summer use. It keeps you comfy yet doesn't let you sweat like cheap hammocks. 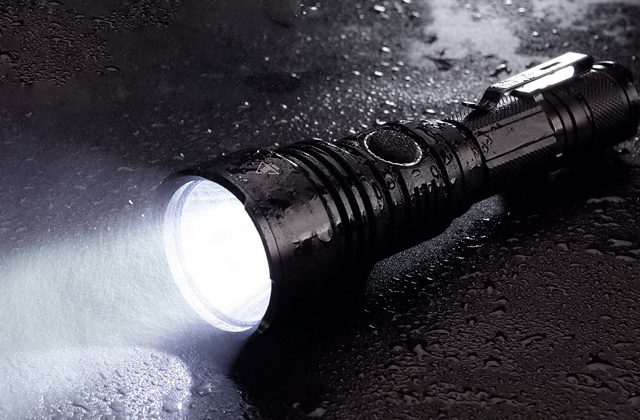 You can use it in your backyard, near the pool, when camping, hiking or picnicking in the country. Plus, it comes with two handy pillows, so that you can use it as a bed when you want to relax and have a nap. What Is a Garden Hammock? A garden hammock can help you create a perfect place for relaxation in your backyard, patio, or near the pool. It's a super-effective anti-stress swing for chilling out, reading a book, or having a quick nap. Typically, a hammock is a sling made of canvas or rope mesh suspended from trees or other supports by straps at both ends. It was initially used by campers, hikers, and explorers during their trips, but now hammocks can be found just anywhere from beaches to private pools. This swinging couch has become popular because of the cosiness and portability it brings. It can wrap you with comfort and provide your body the needed relief just anywhere you are, whether it be in your garden or camping site. The calming, rocking motion of a hammock makes you feel like a baby being nursed by your mother, promoting a deep and satisfying sleep. For this review, we have selected only the best garden hammocks that can come in useful on numerous occasions. They are comfy, supportive, and portable. To complete your lounge zone, you may also want to buy a sun lounger. It will allow you to soak up the sunshine and get the perfect tan.